Earlier this week, Jenn wrote about trying out the latest Puma workout shoes. While they’re not hard-core running shoes designed for marathons, they’re great for lighter jogs or gym workouts. I like to switch up my shoes depending on what I’m doing for the day. For the gym and training sessions, I grab my Pumas or Nike training shoes. 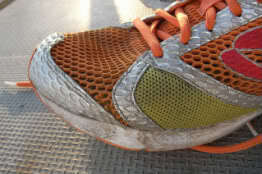 For running, I’ve got another pair of Nikes ready to go and I love my Asics. I’ve found that swapping my shoes out for specific workouts helps them last longer in addition to giving my feet the support they need that day. What about you? Very necessary but I am running out of shoe storage room! I have yet to try out my new trail running shoes because I don't live near trails but they are so comfy I may try them at the gym. Of course they're pretty too, which I can't resist!